This chapter reexamines perspectives on gifted education in the third millennium. Different sources of information enrich our knowledge regarding the individual needs and effects of the promotion of giftedness or talent. Relevant sources include the psychometric (status) vs. cognitive (process) paradigms, the descriptive vs. explanatory approaches, and prospective (status diagnostic) vs. retrospective (e.g., expertise) research paradigms. Giftedness or talent research (US-preferred terms) is known as high ability (European-preferred term) research. According to Julian Stanley, we know more about the “whats” than we do about the “whys”. This statement summarizes the status quo of our understanding of giftedness or talent, high ability or expertise, etc. This ascertainment leads to a challenge of gifted education in the 3rd millennium. Gifted education and related concepts shall explain the claim in details. For the past decades, we have believed that East Asian students including those from China and Japan were less expressive and creative. Recently creativity education and research have given a priority in East and Southeast Asian societies. The move complements insufficient spaces of learning in these societies for creative imagination and innovation as they have been focusing on academic excellence in the forms of international competitive assessments and national examinations. There are many aspects in learning that affects creativity of students and teachers and that influence school excellence. 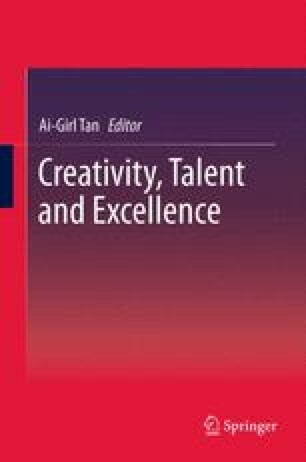 The content of this chapter was read at the ABB-Symposium “Gifted education international” (chaired by Ai-Girl Tan) at the University of Erfurt (Germany) on September 30, 2011, in conjunction of Kurt A. Heller’s 80th birthday celebration.